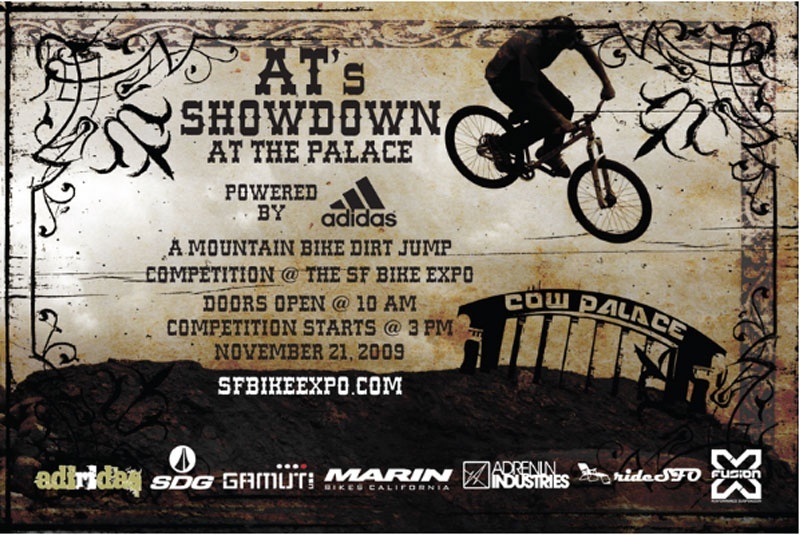 The SF Bike Expo Crew is pleased to announce the addition of AT’s Showdown at the Cow Palace, a mountain bike dirt jump competition. Powered by Adidas and designed by Gravity Pro Andrew Taylor, it will begin with a launch off a Sea Container through the trees into some massive jumps. The competition will feature some of the top pros including Andrew Taylor, Greg Watts. Cameron McCaul, Tyler MCCaul, Paul Basagoitia, Mike Montgomery and more riders to be announced. The SF Bike Expo is taking shape. Don’t miss the greatest eye candy and action on two wheels! I know we are gonna be there. We got everything bicycle overstock under out tent and Christian Wright is gonna kill it! Auburn is gonna bring it heavy!